She is one queen who doesn't travel light. 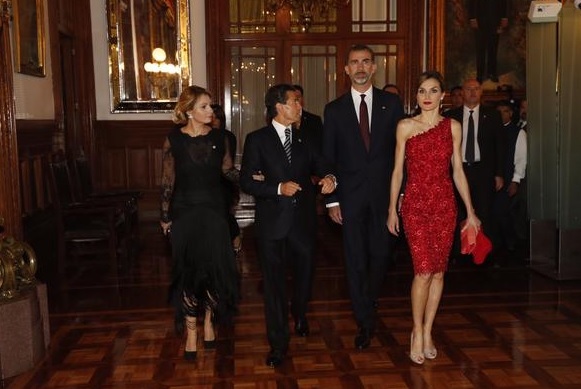 On her recent State Visit to France, Letizia of Spain went through an average of three outfits a day and the record remains intact as she starts another major trip. Since arriving in Mexico on Sunday night, the newest queen in Europe has shown us four outfits. And there are another two days to go. That's a lot of suitcases. Admittedly, finding an outfit that will see a royal visitor through a day of engagements can be a hard ask. The first full day of events for the King and Queen of Spain began with an official welcome by the President of Mexico, Enrique Pena Nieto, and his wife, Angelica Rivera. The Queen of Spain chose a pale green dress with a cream and pink boucle effect jacket with ties for the occasion which also saw her accompany her husband to lay a wreath at the memorial to the Heroic Children. 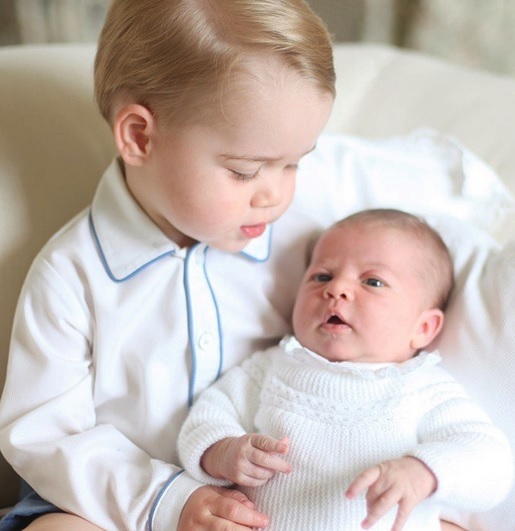 Just like her big brother's, the christening of Charlotte of Cambridge is a slow reveal. We know when, we know where and now - with just under a week before the big event - we know who will be going. But that means there are still lots of gaps to fill in and, if the pattern follows that of George exactly, many of them will stay as mysteries until Sunday when the Cambridge family arrive for the christening of their littlest member. There are always many royal photos every month but some make more of a mark than others. They might be moments caught on camera or records of events that will be written about for decades to come. But they all help sum up four weeks in a moment. Here are the five photos that will linger on as a memory of a very royal June 2015. 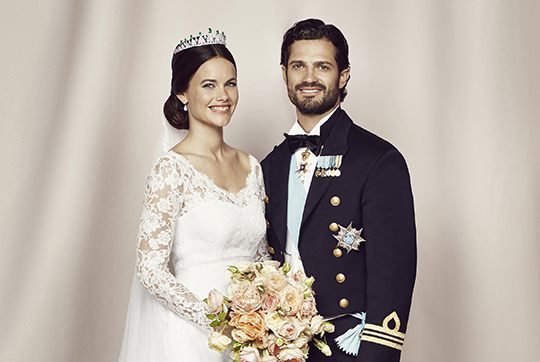 And it all starts in Sweden where Prince Carl Philip, born an heir and demoted to spare seven months later, married Sofia Hellqvist in the Royal Wedding of the year. There were lots of lovely images of a very modern marriage but the one for the history books is their official photo, the first of them as husband and wife, released the day after their marriage. The Royal Wardrobe is a bit lighter in many ways this week. Summer means that the heavy coats have gone, even for Queen Letizia, and it also means there are fewer royals on display as warmer weather usually means a dip in engagements. So get ready for lots of frocks, lots of bare arms and lots of yellow. Lots. 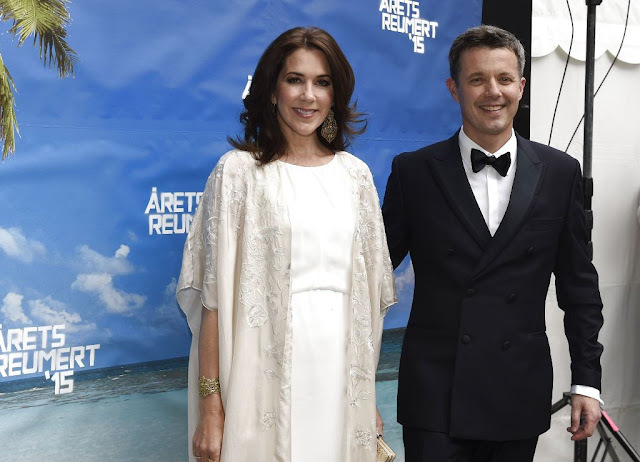 Although we start with cream or dark white or ivory - whatever you want to call it, Crown Princess Mary's evening look of the week was sleek, stylish and an eye catcher with class. Mary donned the dress for a visit to the Reumert Prizes in Copenhagen on June 21st and the combination of light and long dress, crisp and cool coat and fabulous filigree jewellery produced a stunner of a summer look. There was a real summer feel to the royal news this week with everyone beginning to dial it down as the weather warmed up. Telling the royal story on social media is harder when there isn't as much going on and sometimes this week it did feel that things were being shared just for the sake of it. But there were still interesting moments and it's perhaps the pictures and messages that weren't meant to be centre stage that told the biggest story - that was the case in Spain where King Felipe was joined by King Juan Carlos for a series of events to mark the 30th anniversary of their country joining the EU. 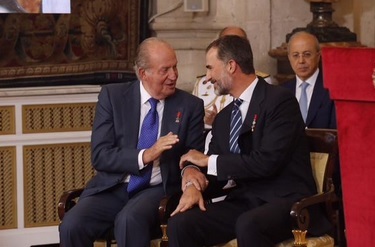 While there was a lot of attention paid to the speeches, it was the image of the two kings together sharing a father and son moment in a tweet on the official Casa Real channel that really caught the eye. The warmth of the image shone out even when shared in that always popular Twitter tradition of a quartet of photos on one message. They're both global superstars and one half of world famous power couples so it's no wonder that news of the Duchess of Cambridge's cuppa with Angelina Jolie has got everyone talking. Kate welcomed the Oscar winner to Kensington Palace on Friday for a private meeting. The hubbies were there too and just when you thought it couldn't get any more stellar, Prince George popped in. It's the royal story the internet has been waiting for. The Jolie-Pitts, minus their six children, were invited to Apartment 1A of Kensington Palace on Friday for tea and cakes (low fat, we presume) with the Cambridges to discuss, among other things, their shared interest in ending wildlife crime. The four spent several hours together, according to reports in US Weekly, and obviously got on well because their tea date lasted far longer than anyone expected it to. There was a minor moment when the woman who has received more presents that quite possibly the rest of the world put together seemed rather unimpressed with her latest gift. But she rallied, as did her host, and it was plain sailing - literally - from that moment on. 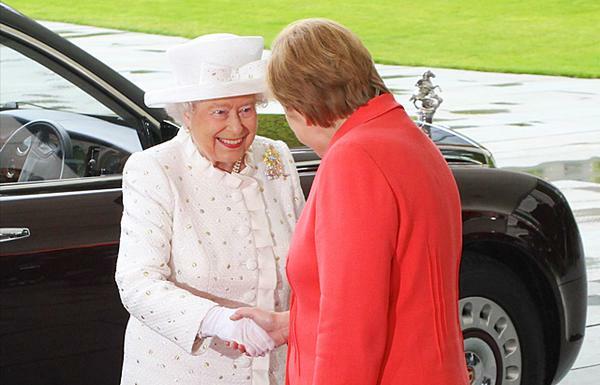 The Queen's first full day of her latest State Visit to Germany was just about picture perfect. 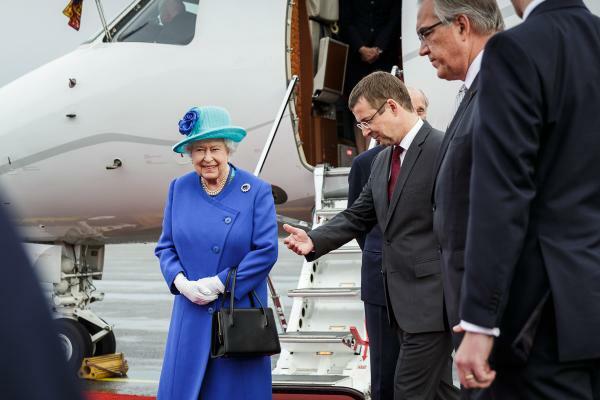 The Queen has arrived in Germany for her fifth State Visit to the country since the start of her reign in 1952. Her three day tour began at Berlin Tegel airport with an official welcome and the sight of the Duke of Edinburgh almost jumping off the plane to get things going. The welcome gets even more official at the start of day one proper when the Queen will be the guest of President Joachim Gauck at Bellevue Palace before travelling by boat along the River Spree for a meeting with Chancellor Angela Merkel. The visit is being seen as highly significant with an increased focus on the Queen's overseas travel as she approaches the age of 90. The fact that Germany has been chosen for this State Visit is seen as important and testament to the relationship between the country and the UK.